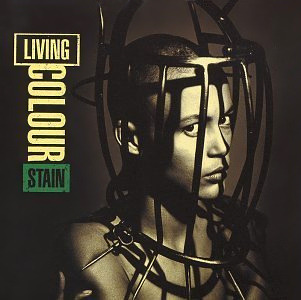 Stain is the third album by Living Colour. It was released on March 2, 1993, by Epic Records. It is the first album to feature bassist Doug Wimbish. Stain features a much heavier and aggressive Living Colour, containing elements of thrash metal and industrial music. It reached #26 on the Billboard 200; however, the band would split up on January 1995 following a tour with Bad Brains. One of their last shows, before reuniting years later, would be a performance at CBGB's. The cover art shows a woman wearing a brank. As of 2011, the album is out of print and problems with the rights ownership make a reissue unlikely. However, it is available as an MP3 download.